Over the past 20 years, research in the fields of museum studies and museum education have firmly established the importance of the social dimension of visitors’ museum experiences and the learning that happens in museums (see this great 2012 post from Regan Forrest’s Interactivate blog). In addition, a wealth of research from more than 50 years of educational psychology speaks to the social and cooperative aspects of learning in more formal educational settings (see this extremely useful resource packet developed at Stanford on “Learning in a Social Context”). So whether sitting in a classroom or walking through an art museum, we learn and make meaning through our interactions and conversations with the people around us. Last week, I was invited to the Crocker Art Museum in Sacramento to give a talk to their volunteer docents on the topic of “dialogic and conversational touring.” I have always been a strong advocate for conversational pedagogy in museums, practicing this form of teaching myself on a regular basis as well as spending considerable time these past several years thinking about how to bring conversation into the core of docent education and tours. Thrilled to have the opportunity to work with the docents at the Crocker, I used this as a way to crystallize some of my thinking about the learning power of conversation in museums. I thoroughly enjoyed my time with the Crocker’s docents and education staff (special thanks to Jill Pease and Stacey Shelnut-Hendrick), and I thought I would share some reflections here on the topic of conversation and museum teaching. What Does ‘Conversation’ Mean to Me? Since beginning my museum career in a largely contemporary art museum, I have formed so much of my own teaching practice from ideas of pedagogy and human connection advanced by contemporary artists. While didactic wall texts, curatorial essays, and academic lectures often over-intellectualize and dull the interests that contemporary artists have in education and public engagement, I continue to find that so many artists are constantly thinking about the ways that their work can bring people together to think, talk, exchange ideas, make connections, and have meaningful conversations about issues relevant to our lives. Rebecca Belmore is one artist whose work has powerfully ignited my own thinking about conversation, about whose voices get to be part of a conversation (or don’t), and about the role that power plays in the conversations we might have in institutions such as museums. 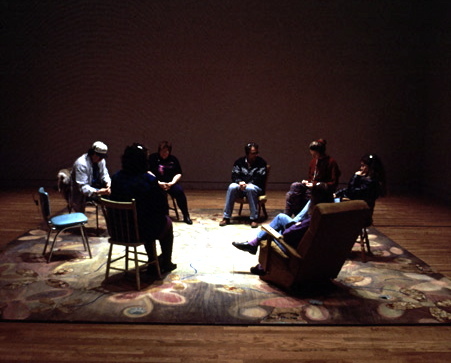 I first encountered her performance and installation work during one of my feminist and gender studies courses in graduate school, specifically her 1992 piece entitled Mawu-che-hitoowin: A Gathering of People for any Purpose (shown above). In this work, Belmore arranges a circle of chairs taken from her own kitchen and the living spaces of women closest to her. Viewers are invited to sit down, put on a pair of headphones dangling over each chair back, and listen to the stories of Belmore’s female community talking about their lives as native women in Canada. What strikes me most about this work is how Belmore welcomes participants into a circle of community, a form of talking circle that embraces voices that would likely otherwise go unheard. Sparked from inspirations such as these as well as years of in-gallery experiences, I’ve developed some overarching frameworks that have helped me think about creating an environment for conversation while teaching in an art museum. First of all, I continue to find that the structures of engagement, or physical arrangement of people in the space of the gallery, has a strong correlation to the type of conversations that can occur. In addition to simply how we arrange our groups, there are certain power relationships that we create as we position ourselves as educators and facilitators of meaningful conversations. I’m going to briefly dive into both of these areas, but far more pixels could certainly be spilled about each topic — and I hope maybe we can have some discussion in the Comments section below to pull out more ideas. In preparing to speak about “conversational touring” at the Crocker Art Museum last week, I spent considerable time thinking about the underlying structures that can establish a conducive environment for meaningful conversations (or that can prevent them from happening). For me, the physical space we create with our group is always so important, sending an immediate message about the types of interactions we expect to have. 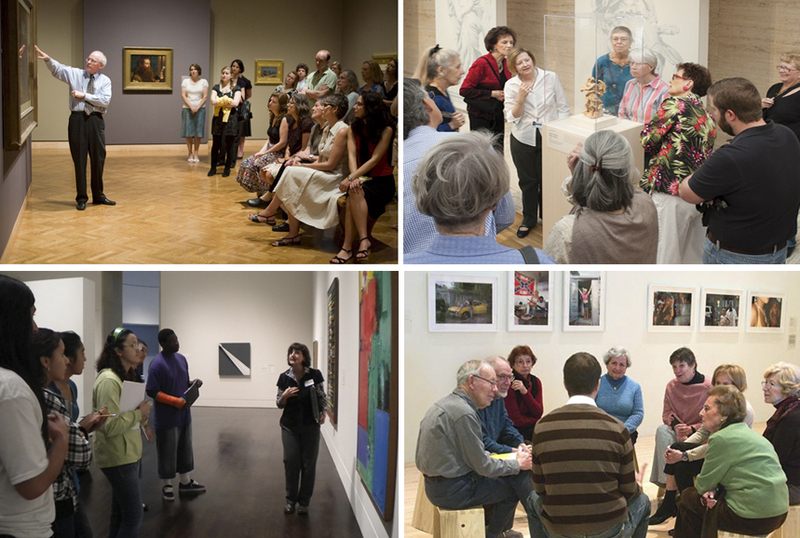 I used the photos below (pulled randomly from Flickr and Google) to illustrate a few examples of how we, as educators, can create better structures of engagement in the galleries. The two images on the left show a much more traditional and common structure of engagement, with an educator or “tour leader” at the front near the artwork and then the group a bit farther away. While this is a completely valid and effective way to lead a tour, it just does not lead to lots of conversation. Any dialogue and exchange happening is between the tour leader and the participants, with very little participant-to-participant communication possible (the core of that social, cooperative dimension of learning). When the docents at the Crocker were examining these photos with me, they also noticed how much the participants body language seemed to support their mediocre levels of engagement. By contrast, the two photos on the right show a very different structure of engagement — something that actually looks a lot more like Rebecca Belmore’s circle of chairs. The educator or tour leader becomes a part of the group, and the structure of the circle creates a more effective space of engagement where focused looking, questioning, and thinking can occur. It creates a better environment for conversation and discussion, as well as greater participation among the group (students and participants are not as detached from the experience — teachers and students all become learners in the gallery experience). While this subtle difference can seem fairly obvious, I could not even begin to count how many docents or educators I have observed that struggle with making connections with visitors — much of which could be solved with a simple re-arrangement of their group. As we make decisions about the physical arrangement of our groups, it is also important to be aware of the power relationships (often unintended) that we set-up between ourselves and our group, and among the group itself. In a good conversation, as Michael Brenson describes, “ownership is shared.” We aim to create a safe environment for open exchange and dialogue in which everyone’s voices and ideas are respected. This type of open conversation can be very difficult to achieve if we set-up a one-sided power dynamic with our group. In the two photos on the left (below), we see fairly typical docent-led school tours. By standing and towering over their group, however, the docent or educator has established a traditional teacher-student power relationship that will not lend itself as well to open exploration, creative wondering, and meaningful conversations among the students. Feel free to try this out — have a conversation with someone in your office with one of you standing and the other person sitting on the floor. Yep … awkward at best. The two photographs on the right (above) show exchanges in which the educator and students are closer to the same level; no one is towering over the other. These students likely feel more empowered to look, question, wonder, and discover along with their docent or educator, breaking down the traditional power relationships between ‘teacher’ and ‘student.’ In my own teaching experiences, this almost always rings true — as soon as we all sit on the floor and are at a level playing field, the conversation ignites and we are all more open to sharing our thoughts, insights, and questions. With adult groups, arranging a semi-circle of gallery stools is an easy way to establish this conducive environment for meaningful conversation. 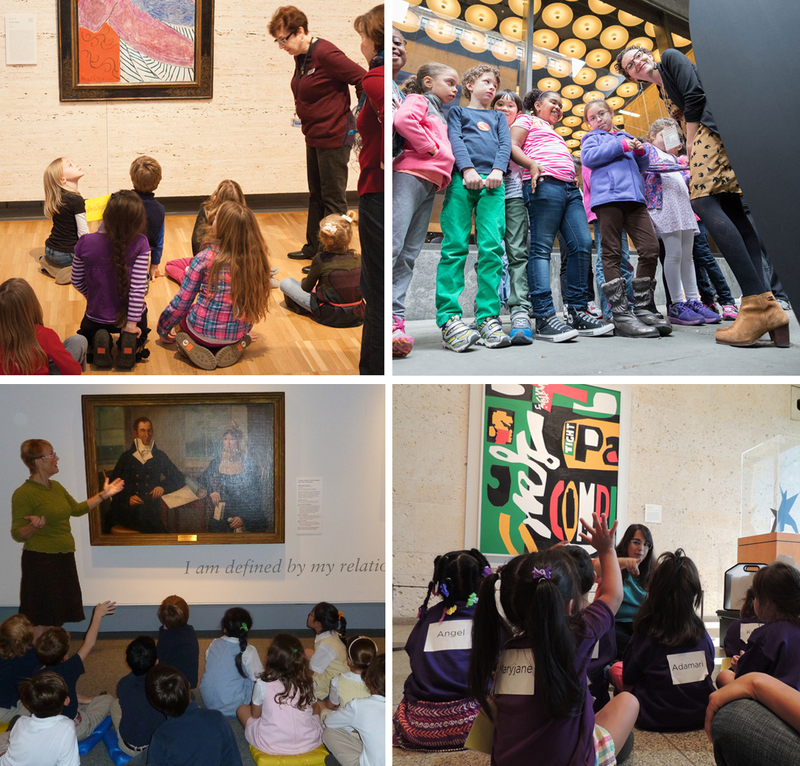 How do you create meaningful conversations in your museum? How important is conversation for tours and education experiences at your museum? What is your favorite way to start a tour that will be focused on conversation? How do you set-up that expectation from the beginning? What types of teaching techniques do you find bring out the most interesting discussions (for students or adults)? How do you ensure that the diverse voices of participants and students can be heard? Reflections on how to embed conversation into museum tours. Interesting read for all educators. At the Grand Rapids Art Museum, conversation is king. I have been a student of conversational tours since my time as a graduate student at the University of Texas with Melinda Mayer who first introduced me to the concept (see M. Mayer “Scintillating Conversations in Art Museums” 2007). Setting your expectations at the beginning of the tour for a conversation is important, it lets your guests know what to expect. With children I ask them what a conversation is, they usually answer with something like “when one person talks, while the other listens, then talks back”, I feel like this is a great description of a conversation because it places equal value on talking as well as listening. Active listening is one of the most important skills for docents to lead successful conversational tours. By listening, paraphrasing, and connecting each response, every view is validated and each voice is given equity. The best types of interaction I have during tours is when the conversation takes over and I cease asking questions, when the group is transformed from a group of museum goers with a docent to a group of friends chatting in a living room, when the conversation moves organically from person to person like a natural conversation. Incidentally, this technique is difficult to execute even though most of us are skilled in having everyday conversations with those we interact with. Conversation in the galleries takes time, practice, research, and creation of lots of questions that will elicit meaty responses (75% of which you will not use on any given tour), but for those who deliver the conversational tour the rewards for both the docent and the group are really extraordinary. I could not agree more, Andrea. Learning to facilitate good conversations in the galleries does take lots of practice and experience, but the rewards are awesome! And I love it when the group takes over the conversation and our role of ‘facilitator’ fades into the background — I used to tell docents that the best teaching experience would be the one during which the educator could go use the restroom and the group would be so wrapped up in conversation and looking that they wouldn’t even notice that the educator had left. This type of situation can most often occur when we, as educators, are really listening and encouraging discussion among the group, rather than always being the ‘leader’ that the group relies on for the conversation to move forward. Are we necessary to ask the “what more can we find?” types of questions, or can we empower our group to drive the learning experience forward? You mention Melinda Mayer, and I feel bad having not included a reference to her in this blog post — she is a powerful influence on my own thinking about conversation, too. I used her article in every one of my docent training classes, and I was fortunate enough to bring her to the Saint Louis Art Museum to work with our docent group there (what a memorable experience — she is a rockstar!). She really sets-up this idea of “structures of engagement” and how we build relationships with our group, as well as the “sticky” concepts that we can pull from works of art to ignite meaningful conversations. So, I big shout out to Melinda! I also owe a lot to Rika Burnham and Elliot Kai-Kee, the great and mighty Jedi knights of art museum teaching. Without my numerous experiences with Rika and the extraordinarily powerful conversations she brings out in front of works of art, I would not be so passionate about this form of teaching and learning. There are others to mention (of course, the Obi-Wan Kenobi of museum learning, George Hein) — perhaps we should have a post at some point about those mentors and colleagues that have inspired our practice. I agree with Andrea that setting the expectation for conversation at the beginning of the tour is key. In my own tours I like to do this by starting with a work of art that I know will generate questions from the students. At the El Paso Museum of Art we have a sculpture by Carole Feuerman, titled “Summer.” Typical of Feuerman’s work, it is a hyper-realistic depiction of a female swimmer, this particular one lying on a inner-tube . Summer is located right at the top of the stairs that lead into our main galleries and automatically gains the attention of nearly every visitor that walks up those stairs. Almost immediately as we approach this work of art, I hear the students quietly asking each other “is it real?” I love this because I can use their genuine curiosity about the piece to turn their questions back on them. I use their questions to encourage them to look more closely at the work and discover the answers for themselves. In a best case scenario tour this helps set the expectations for the students that they can ask questions and answer each others questions. It gets them talking and helps break into the fear of being wrong. I also like to tell my students that there is no such thing as a wrong answer in art, all interpretations are valid and we need to be respectful of each other’s ideas. Rather than fight the fact that they are all going to stop at this sculpture whether I want them to or not, I use their natural curiosity to establish a comfort level with me and the museum. It’s my belief that this makes conversations about the other works we will look at easier and more natural. Reblogged this on Museum Engage. George – thanks for letting us know about that project in Copenhagen. I’ll definitely contact Poul about ordering the English version of that book (I saw that it has been translated into 3 languages now). Sounds interesting, especially in terms of the role conversation can play with children who are developing a relationship with the museum as a space for learning. I want to thank you Mike and all the others who commented on this topic. I’m currently working on my PhD research’s observations on different approaches for guided tours including dialogued visits, and so all the comments were very relevant. I must confess that although everyone talks about it in theory, when it comes down to it, I find tour methods being used that have not changed since I started my work as a “guide” in museums over twenty years ago. I think the difficulty lies in the misunderstanding of certain issues as you mention here as: “Power relationships, who and how question questions and democratization of the interpretation.” Because of this, I think the museum’s educator’s professionalization (methodological) is essential, as the work of creating a good dialogue is much more complicated than studying the contents of the subject. Last year Rachel Shalita, an Israeli museum specialist, published a very interesting book which proposes seven steps to facilitate dialogue with works of contemporary art. Because this is only in Hebrew , I will list the steps to give you an idea: 1. Spontaneous reaction , 2. Detailed observation, 3. Connections or associations , 4. Possible interpretations, 5. Search of the overall meaning of the piece , 6. Added information , 7. Personal opinion and meaning-making. Thanks, Judith! I’d love to learn more about your research, and what you are finding (both in your observations as well as your literature review). I’d love to connect with Rachel about her book — have you been in touch with her at all? One of my personal passions is teaching with contemporary art, and her book sounds great (unfortunately, I do not read Hebrew). Dear Mike, Judith Saban forwarded me the link to your forum – I find everything here so intersting and insiring!!. My book :Dailogue with Art – focuses mainly on reading contemporary art with “non-professionals” (adults or children) (although I also have good experience of using it with professionals as well). The first steps of the model are based on looking and talking, and no former knowledge is needed. It is amazing how far and deep people can go, watching and talking about contemporary work of art, discovering that they know much more than they had expected, and enjoying it enormously. I think that one of my most important goals is show people that contemporary art is about contemporary issues and of course about their lives, so art is about people, us. .The collective effort is very important here,You’re right – unfortunately my book is (still) only in Hebrew but I hope it will be translated in the near future.